Like all other Rule 5 picks, he needed to stay on the major-league roster the following year. 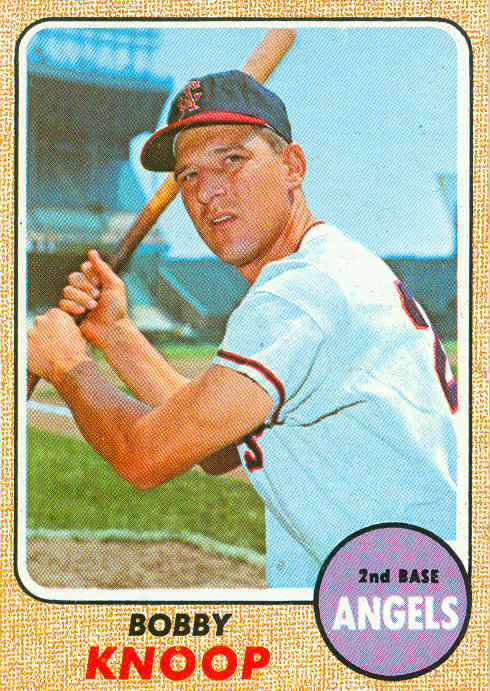 Unlike so many, he was a real contributor, playing in all 162 games (starting 156) as a rookie in 1964. 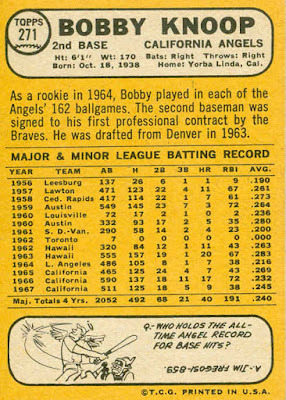 Bobby was a mainstay during his 5 full seasons with the Angels. He played in 162, 162, 161, 159, and 152 games over that span, always accumulating more than 500 plate appearances. In 1966 he made his only All-Star team, and led the AL with 11 triples. However, he hit higher than .249 only once. After starting 23 of the first 24 games in 1969, he was traded in mid-May to the White Sox for 2nd baseman Sandy Alomar and pitcher Bob Priddy. Knoop started 100 and 117 games in his 2 seasons with Chicago. With the Sox having acquired 2nd baseman Mike Andrews from Boston in December 1970, Knoop was traded to the Royals during spring training 1971 for infielder Luis Alcaraz. 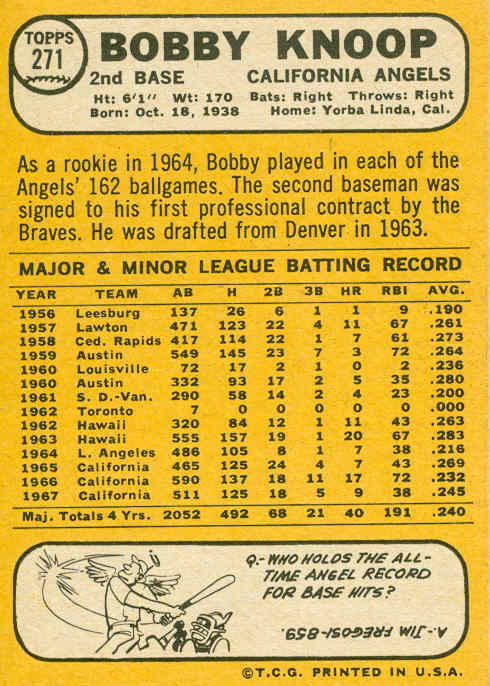 Bobby was the backup infielder for KC in 1971, but started 41 games at 2nd base, mostly after Cookie Rojas was lost for the season in late-August. 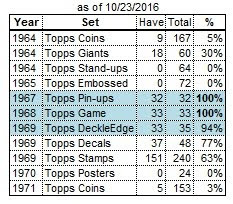 In 1972 he only started 22 times, his final game coming on September 20th. He was released after the 1972 season, ending his 9-year career. He was a coach for the White Sox, Angels, and Blue Jays for 21 seasons (1977-2000). 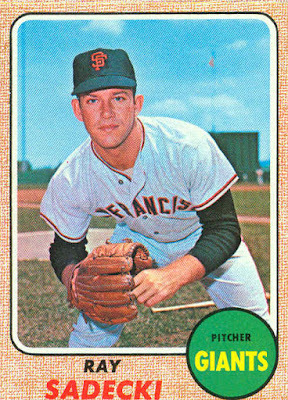 Ray Sadecki was a starting pitcher for the Cardinals and Giants in the 1960s. He later played for the Mets and several other teams. Ray was signed by the Cardinals in 1958 and made his big-league debut with St. Louis in May 1960. At age 19, he was the team’s #3 starter behind Larry Jackson and Ernie Broglio. In 1961 he led the staff in starts and innings pitched, shared the wins lead with Jackson, and was 2nd in strikeouts to Bob Gibson. 1962 was a down year. 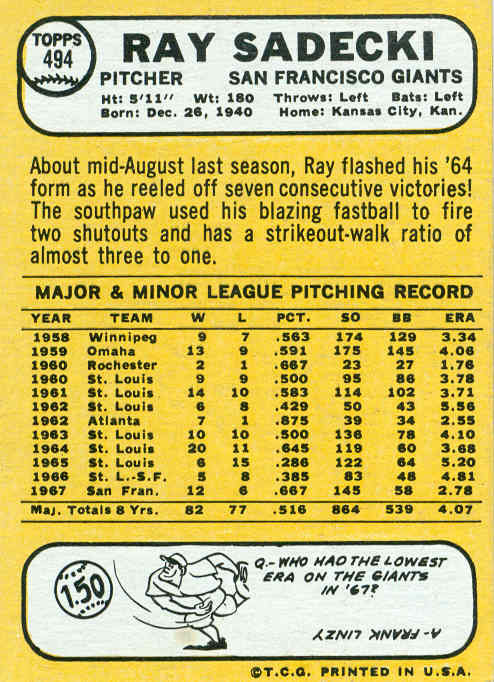 By the end of July Ray’s record was 6-8, and he was sent to the minors for the remainder of the season. 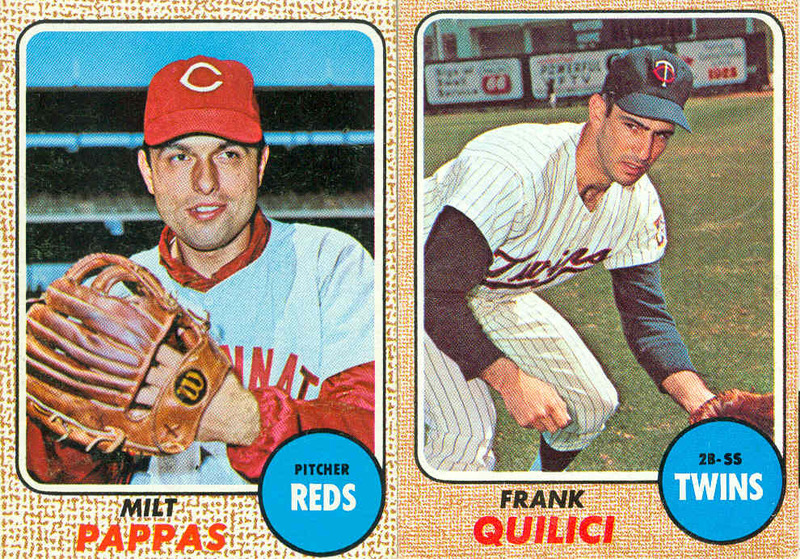 Ray was back in 1963, joining Gibson (18 wins), Broglio (18), and a rejuvenated Curt Simmons (14) in the rotation. (Jackson had been traded to the Cubs in the off-season.) He compiled a 10-10 record as the #4 starter. 1964 ended with the Cardinals winning the World Series. 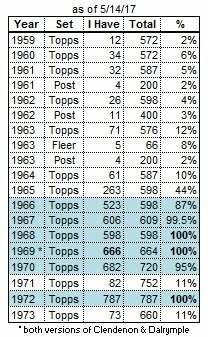 Along the way Sadecki won 20 games, just slightly ahead of Gibby’s 19 and Simmons’ 18 wins. In 1965 the Cards’ rotation was reduced from the “Big 3” to the “Big 1” (Gibson), as both Sadecki and Simmons lost 15 games. The following May, Sadecki was traded to the Giants for slugger Orlando Cepeda. 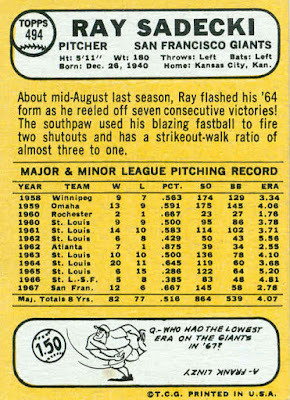 Over the next 3 ½ seasons, Ray manned the #4 spot in the rotation, behind Juan Marichal, Gaylord Perry, and Bob Bolin (and later Mike McCormick). He was 32-39 in his time with the Giants, never matching his success with the Cardinals, but he did win 12 games twice and piled up a lot of innings for the Giants. After 5 uneventful season with the Mets (used as a starter and reliever), he was traded back to the Cardinals for Joe Torre. After 2 months with St Louis, he was flipped to the Braves, and by Labor Day he was with the Royals. Sadecki pitched 5 games for Kansas City at the end of 1975, and 3 games at the start of 1976 before he was released in early May. The Brewers soon picked him up, and he relieved in 36 games for the remainder of the ’76 season. Released again, Ray was signed by the Mets in March 1977 but was released on May 2nd, ending his 18-year career. Sadecki passed away from cancer in November 2014 at age 73. 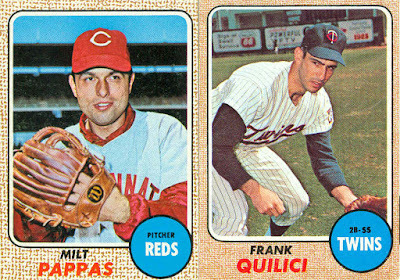 This is post #11 in the series: Milt Pappas and Frank Quilici - both born on 5/11/1939. Pappas played 17 seasons, the first 9 with the Orioles. Traded to the Reds after the 1965 season for Frank Robinson, he played 2 1/2 seasons with Cincinnati, 2 with the Braves, and 3 1/2 with the Cubs before retiring after the 1973 season. He made the All-Star team in '62 and '65. Quilici was a backup 2nd baseman for the Twins from 1965 to 1970, playing in the post-season in his first and last seasons. He also managed the Twins from 1972 to 1975.